Welcome to the Show Off Your Stuff party! The place were were we all get together and SHOW OFF OUR STUFF! 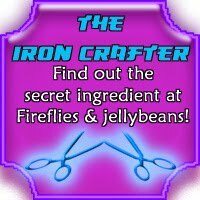 This week I am showing off my Iron Crafter Competition! Click on the button to find out what the next secrete ingredient. Ooooh . . . I'm so excited to see my button up there! Thanks so much!!!! Thanks so much for hosting. Can't wait to check out all the posts & projects! Thanks so much for hosting! I can't wait for iron crafter!! Happy Thursday! Have a great weekend! Thank you for hosting! Off to visit some great ideas!